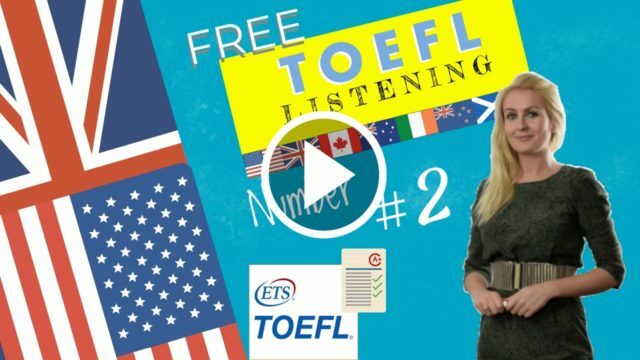 An introduction to the toefl listening format with examples and exercises. This lesson contains an example of a typical TOEFL Listening which waxs taken from a previous exam. Watch the video and listen carefully to the dialogue. LECTURE TRANSCRIPT of the toefl listening format including actual exam questions. (Male professor) Today I’d like to introduce you to a novel that some critics consider the finest detective novel ever written. It was also the first. We’re talking about The Moonstone by Wilkie Collins. Now, there are other detective stories that preceded The Moonstone historically—Um, notably the work of Poe, Edgar Allen Poe’s stories, such as, “The Murders in the Rue Morgue”, and . . . “The Purloined Letter.” Now these were short stories that featured a detective, probably the first to do that. But The Moonstone, which follows them by about twenty years, it was published in 1868, this is the first full-length detective novel ever written. Now, in The Moonstone, if you read it as, that is to say, come to it as a contemporary reader, what’s interesting is that most of the features you find in almost any detective novel are in fact already present. It’s hard at this juncture to read this novel and realize that no one had ever done that before, because it all seems so strikingly familiar. It’s, it’s really a wonderful novel and I recommend it, even just as a fun book to read, if you’ve never read it. Um, so in The Moonstone, as I said, Collins did much to establish the conventions of the detective genre. I’m not gonna go into the plot at length, but, you know, the basic setup is , well, there’s this diamond of great, of great value, a country house, the diamond mysteriously disappears in the middle of the night, and, the local police are brought in, in an attempt to solve the crime, and they mess it up completely, and then the true hero of the book arrives. That’s Sergeant Cuff. Now, Cuff, this extraordinarily important character, well, let me try to give you a sense of who Sergeant Cuff is, by first describing the regular police. And this is the dynamic that you’re going to see throughout the history of the detective novel, where you have the regular cops, who are well-meaning, but officious and bumblingly inept, and they are countered by a figure who’s eccentric, analytical, brilliant, and, and able to solve the crime. So, first the regular police get called in to solve the mystery , and well, , in this case, detective, Superintendent Seegrave. When Superintendent Seegrave comes in, he orders his minions around, they bumble, and they actually make a mess of the investigation, which you’ll see repeated, you’ll see this pattern repeated, particularly in the Sherlock Holmes stories of a few years later, where,the, Inspector Lestrade, this well-meaning idiot, is always countered,by, by , by Sherlock Holmes, who’s a genius. So, now Cuff arrives. Cuff is the man who’s coming to solve the mystery, and again he has a lot of the characteristics that future detectives throughout the history of this genre will have. He’s eccentric. He has a hobby that he’s obsessive about—in this . . . in his case, it’s the love of roses. He’s a fanatic about the breeding of roses; and here think of Nero Wolfe and his orchids, Sherlock Holmes and his violin, a lot of those later classic detective heroes have this kind of outside interest that they, they, go to as a kind of antidote to the evil and misery they encounter in their daily lives. At one point, Cuff says, he likes his roses because they offer solace, and well, an escape, from the world of crime he typically operates in. Now, these detective heroes, they have this characteristic of being smart, incredibly smart, but of not appearing to be smart. And most importantly, from a kind of existential point of view, these detectives see things that other people do not see. And that’s why the detective is such an important figure, I think, in our modern imagination. In the case of The Moonstone, I don’t want to say too much here and spoil it for you, but well, but the clue that’s key to, to, the solving of the crime is a smeared bit of paint in a doorway. Of course, the regular police have missed this paint smear or made some sort of unwarranted assumption about it. Cuff sees this smear of paint, this paint, the place where the paint is smeared, and realizes that from this one smear of paint you can actually deduce the whole situation, the whole world. And that’s what the hero in a detective novel like this, brings to it that the other characters don’t, it’s this ability to, well, see meaning where others see no meaning and to bring order, well, to where it seems there is no order. The modal verb can explained in English Beginners Course Lesson 9. March 16, 2018 Comments Off on The modal verb can explained in English Beginners Course Lesson 9. Past perfect and past perfect continuous difference in English Lesson 73. April 8, 2018 Comments Off on Past perfect and past perfect continuous difference in English Lesson 73.